Balloons make EVERY birthday better! 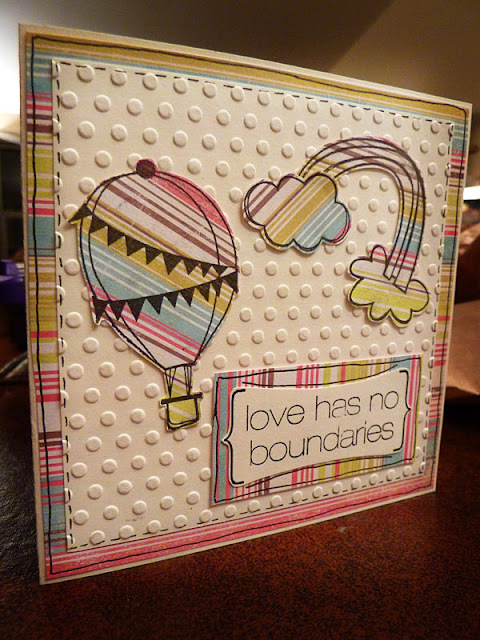 I totally love balloons - so it is pretty obvious why I LOVE this stamp! This is easily my favorite stamp from Unity Stamps newest Kit of the Month - so since it arrived Saturday, I couldn't wait to get my hands on it! 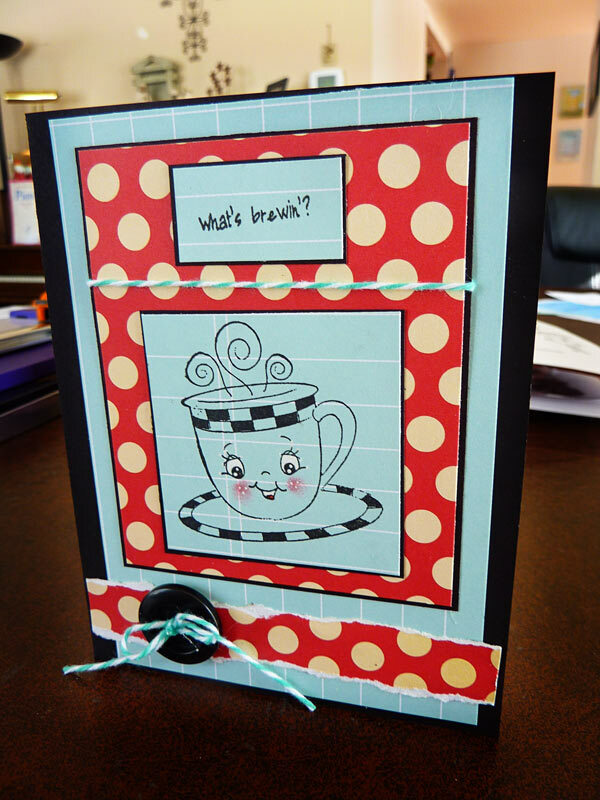 This is one of those cards that just kind of came together by accident - but I love the (unexpected) result! 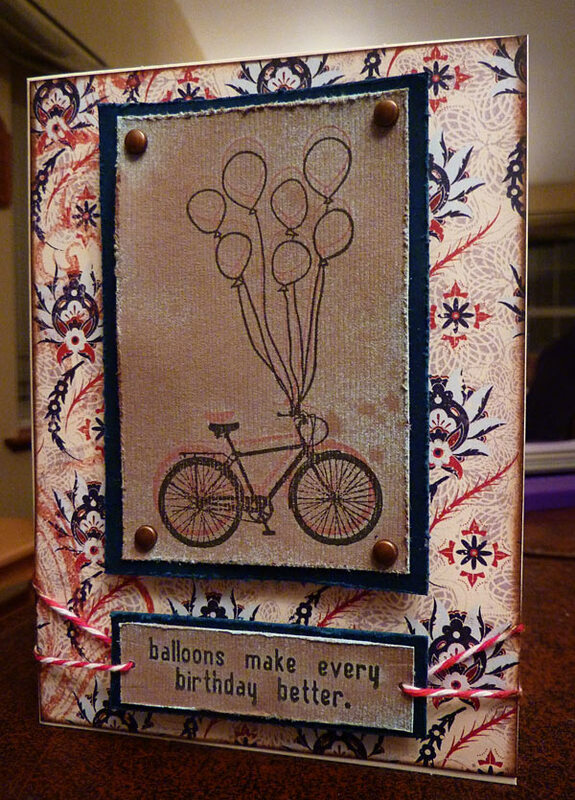 I started off by stamping the bike and balloon image in red, then distressed the paper and it's darker blue mat with my Tim Holtz distress tool. On a whim, I decided to lightly spray it with some Tattered Angels Glimmer Mist in Creme de Chocolat that I had not tried out yet. Then, since that hid the image a little more than I wanted, I decided to restamp it in black. Of course, my aim was bad and I missed, but I kind of like how it is off-set a little anyway. Added the brads to hold the layer together, pop dotted the bike and sentiment, used a little Baker's Twine at the side of the sentiment, and finished by inking the edge of the background paper before attaching it to a pre-made card. I am SOOOO in LOVE with how this card came out!!! It is for the mom-to-be of a baby shower that a friend and I are hosting tomorrow after church. 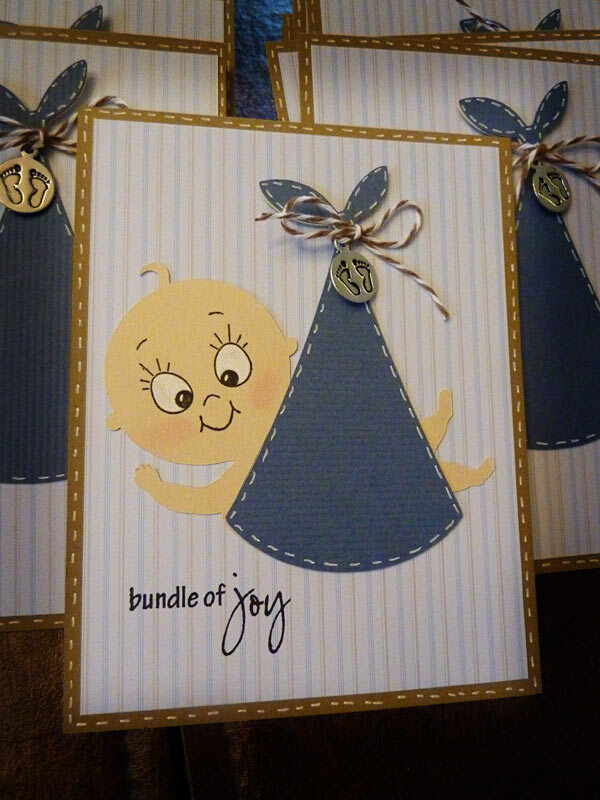 She is having a little boy (in case you didn't guess from the card!) This idea popped into my head tonight - and just in time, since I didn't have much time left to make it! Still need to cut some stuff out to decorate the diaper cake with, but that will be next! Also going to enter this in the A - Z project at Getting Cricky with K Andrews. So...all the cuts are from Nate's ABC's...one of my all time FAVORITE cartridges!!! (I can't wait to get Kate's ABC's!!!) I welded the letters on my Gypsy using the font on Nate's ABC's, and covered them with Glossy Accents. The snail and the dog have some dots on them, and then I pop-dotted them from the background. Added some corners cut from my Fiskars corner punch, with a bit of Glossy Accents on them as well, and finished by using zip dry glue to attach some Baker's Twine around the edges. Had an interesting day yesterday...actually, it's just been an interesting week! Started off the week on Sunday night, getting my daughter in my lap while I was sitting in my scrapbooking chair, and leaning back to snuggle her...only forgetting that the chair didn't have a back! Yep - fell smack back on our hardwood floor head and neck first!!! Took a couple days of visits to the chiropractor to even be able to move! So, on Wednesday we got nearly a foot of snow, and then it just got really cold. Then we woke up yesterday to a broken furnace!!! Fortunately, we were able to get it fixed, and it was lovely to wake up to a WARM house this morning!!! Anyway, this is the card I made while my hubby was trying to work on the furnace. I needed something to do, and also needed to stay OUT of his way!!! I was a little distracted (and COLD!) so it took a little longer than normal, but I finally got it done, with the help a friend who was over. We had a mixed up day - were supposed to go shopping together in preparation for a baby shower this weekend. Finally made it out the door though! So for this card, I used another Unity Stamp from my grab bags, added a Peachy Keen face, a Papertrey Ink sentiment, a button, and some Baker's Twine. Needed to think of something warm and cozy I guess! Anyway, thanks for looking! This fairy stamp is another one that I got in my Unity Stamp Grab bag, and have been just itching to use. So I sat down with some of my scraps last night, and played a little. This one came out a little different than what I planned, and I'm still not entirely sure if I'm happy with it - it almost feels like it just needs a little something more, but I'm not sure what! Used Unity Stamps for the fairy and the sentiment, a Martha Stewart border punch for the vine edges, added some Glossy Accents to the fairy's wings, and some Stickles to the flower and along the border edges. 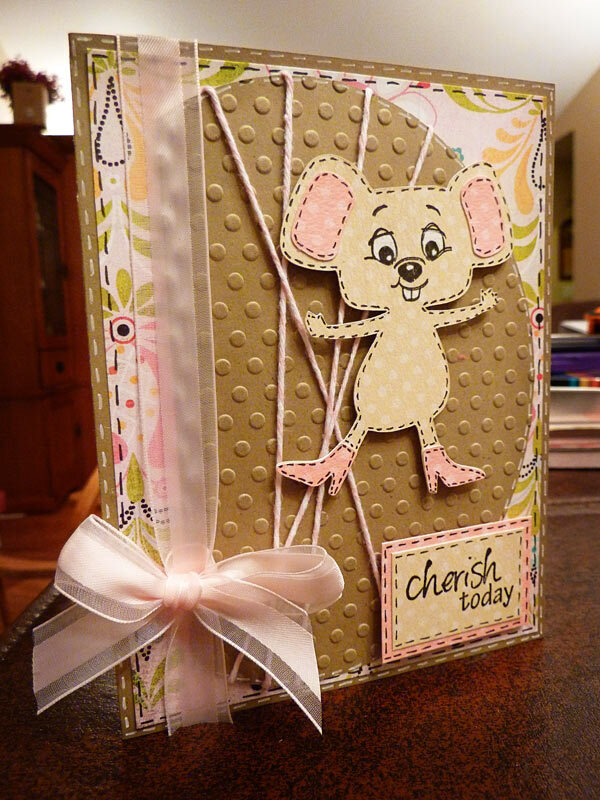 Pop-dotted the sentiment as well. Let me know what you think - does it still need something? Thanks in advance! Just thought I would quickly share the birthday card I made last weekend for my big brother! It was super simple, mostly because it was a guy card - still think those are some of the hardest to make! 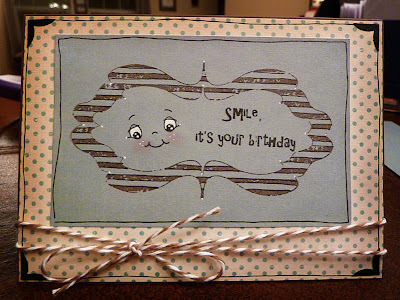 Anyway, the frame stamp is from Unity Stamps, I added a Peachy Keen Face from the Wide-Eyed Kids Assortment, a sentiment from Pink by Design, and a Baker's Twine bow. Finished with some doodlin' and some corners punched from a Fiskar's border punch. This card was SOO much fun! And I am really proud of myself - I am able to enter it in FOUR challenges!!! That is a record for me...and something I have been working on - because there are so many fun challenges I want to enter, and I have a really hard time mixing them. So, the first challenge is over at Scrappy Mom's Stamps to use Create a Critter. The second challenge is over at More than Favors Wacky Wednesdays to use a farm theme. 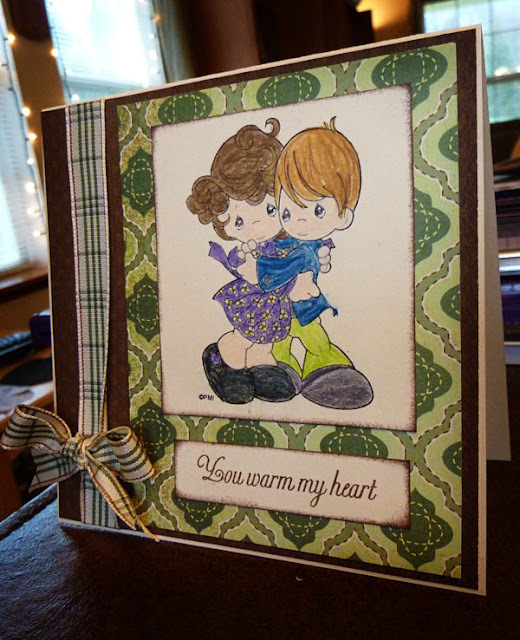 The third challenge is a sketch challenge over at Peachy Keen Stamps Challenge Blog. The fourth and final challenge is on the Cricut Circle Blog, to use an animal cut. The cow is from Create a Critter, with a Peachy Keen face from the Princess faces added to it, and some doodling, inking, and little Baker's Twine bow. The yellow and green background is from Preserves, stretched and lengthened with my Gypsy. 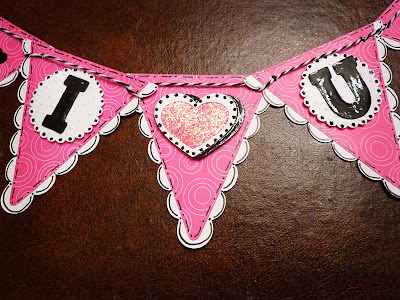 The banner is from Winter Frolic, with a sentiment from Pink by Design. Cut the white square behind the cow, used a corner punch on it, added some doodling, and ran it through the Cuttlebug. Finished by pop-dotting the cow and the center of the banner. Had cherries on my brain lately! I know, kind of random - maybe I'm just wishing for summer! But I had this the red polka dot background (from Lacey Labels) cut out recently for another card, and didn't use it. It just looked SOOO perfect for a cherry card! 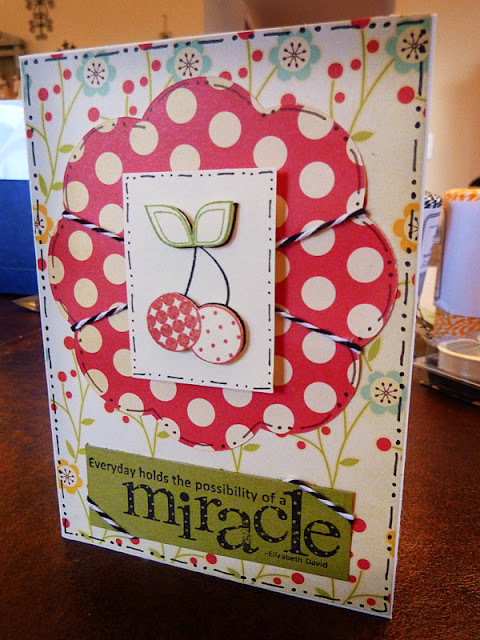 So I stamped the cherry from the August 2010 Kit of the Month in black, red, and green, cut out the cherry in red and the leaves in green, and pop-dotted them on the black one. 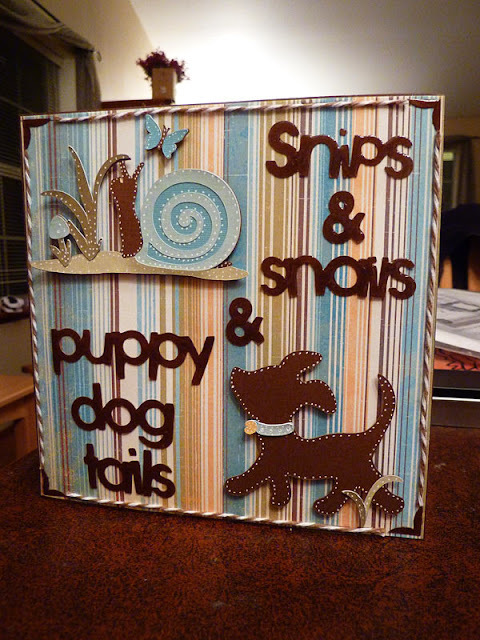 Added a sentiment from the June 2009 Kit of the Month, some Baker's Twine, and some doodles. 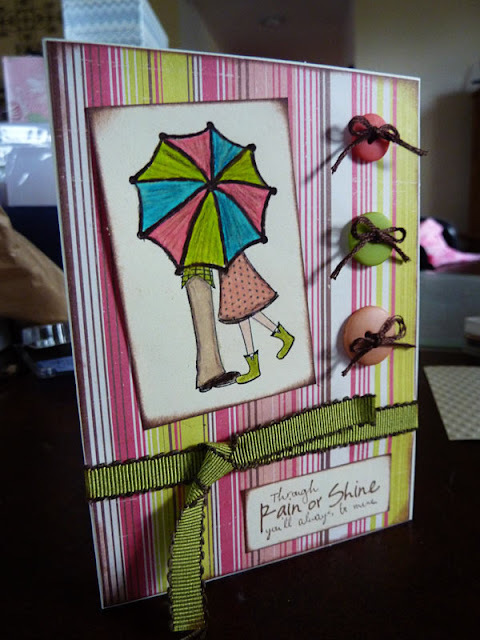 I really wanted to make this card for the Tacky Tuesdays Challenge, so I managed to sneak it together early this morning! I love how it came out! 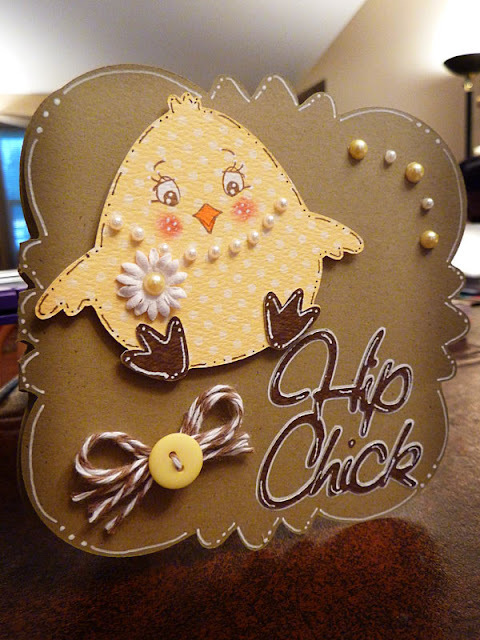 The challenge was to use the chick from Simply Charmed, and the sentiment had to include the word "chick" in it. So I cut the sentiment from Straight from the Nest, then added a Peachy Keen Face to the chick by combining the eyes from the Wide Eyed Kids Assortment and the beak from the Critter Faces. I love combining parts of two different faces to come up with something new and cute! I added the flower to cover up an ink smudge I made (oops!) and then my 7 year old daughter suggested the necklace - and I LOVE how that idea worked! Cut the card shape from Lacey Labels, welding two together with my Gypsy. Added some Baker's Twine in a bow with a button, some stick on pearls, and some doodling around the edges. Fun, fun! Can't believe how the time has flown, and realized I hadn't had a chance to make something for the Peachy Keen Sketch Challenge 45, so I had to take a few minutes tonight to get that done! 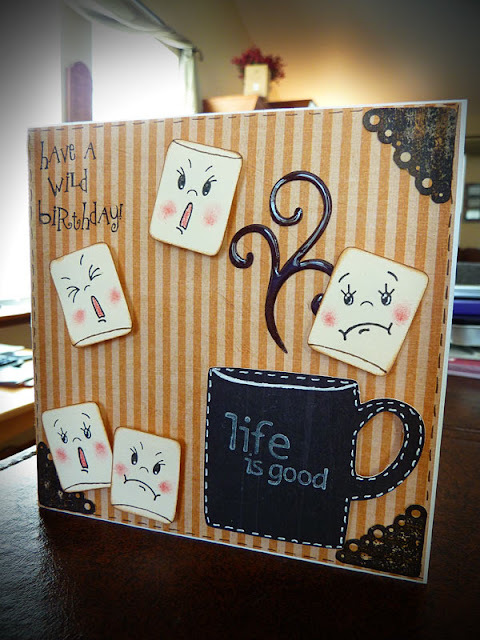 Used Birthday Bash for all the cuts, and some of the new release Peachy Faces (LOVE THEM!). Ran the circle background through the Cuttlebug, added some Baker's Twine, a sentiment from Pink by Design, and lots of faux stitching. Finished off with a sweet pink bow along the side. Thanks for looking - have to be short and sweet...gonna go watch a movie with my hubby! Yep...it is about time for Spring to get here! So...I made a happy card for a couple of challenges! 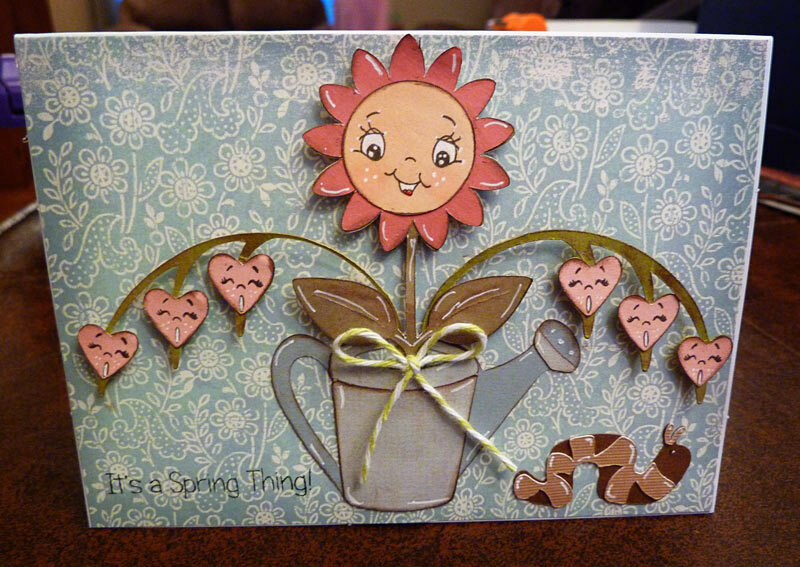 This card is for both the Throwback Thursday challenge at My Creative Time which was to use Walk in My Garden and include flowers, and the Peachy Keen LFIF challenge to make a Spring gift, and include Peachy Keen faces. The watering can and the flowers all came from the Walk in my Garden cartridge, and then I couldn't resist using that cute little "cal-a-pit-er" (as my daughters call them!) from Pooh and Friends cartridge. Isn't he the cutest? 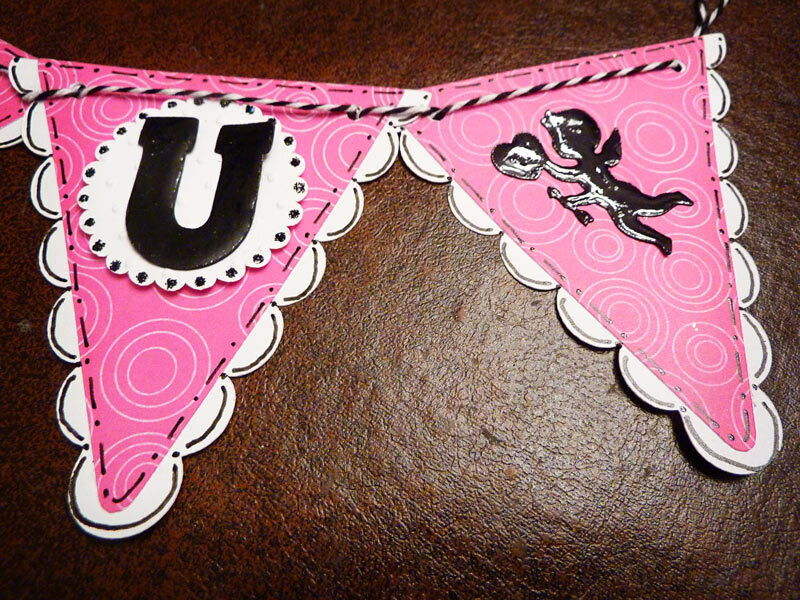 Then I inked everthing, added Peachy Keen faces, some doodling here and there, pop dotted all the flowers, added a sentiment from Pink by Design, and finished off with a little Baker's Twine bow. Had a CRAZY day today, so when I got home, I decided to spend a few minutes making a card for the weeks Cricut Circle Challenge that ends tonight! 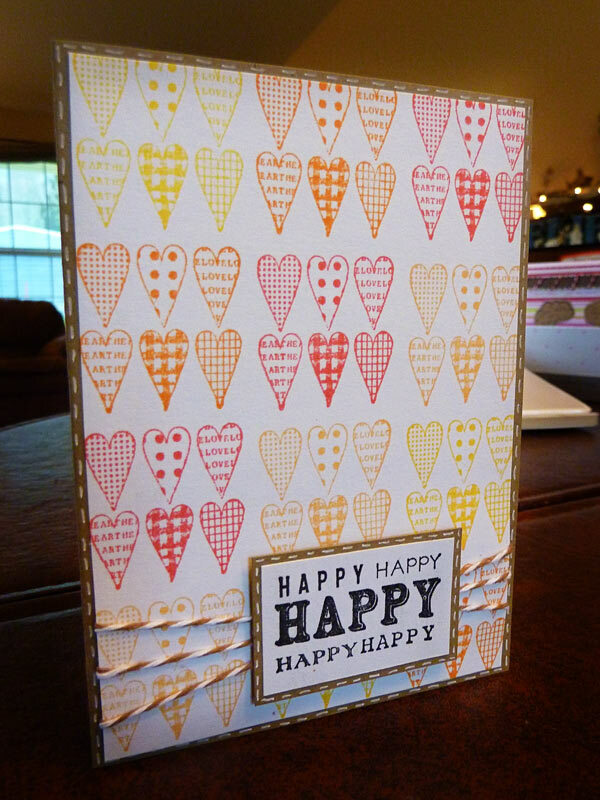 It was supposed to be a love note, include Cuttlebug embossing, and at least 2 Cricut cuts. I also thought I would add it to the new monthly challenge on the Unity Blog as well. Click HERE to read more about that! So...I cut the card base from Wild Card (a sadly neglected cartridge as of late! 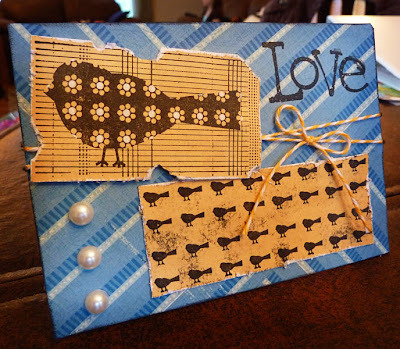 ), cut the center from Preserves and used the Cuttlebug on it, and cut the word "love" from Home Decor with some Glossy Accents over it. 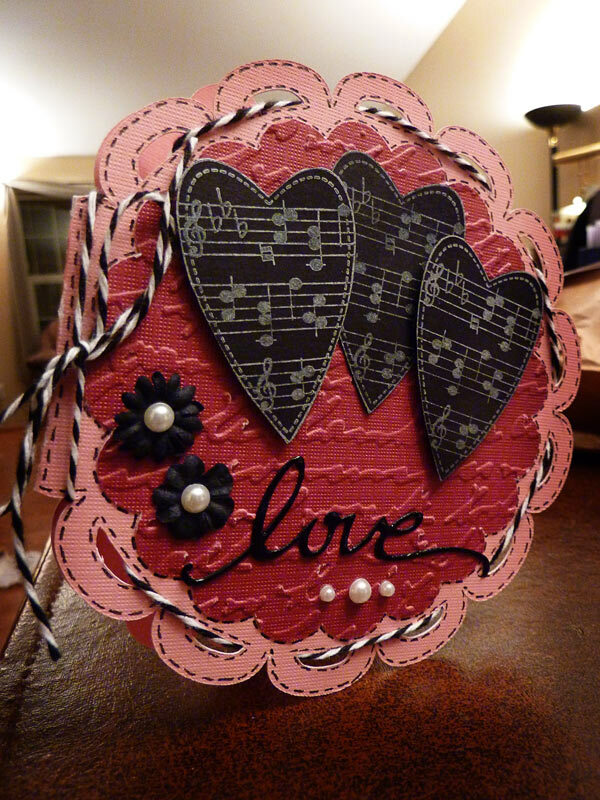 The black hearts I hand cut after stamping in white with one of my grab bag Unity Stamps. I pop-dotted 2 of those when I stuck them down (the second picture shows that a little better). Added a bunch of faux stitching, some Baker's Twine, a couple of tiny Prima flowers, and some stick on pearls. For some reason lately, hot air balloons have fascinated me. Unfortunately, I am afraid I am probably far too chicken to ever actually go UP in one, but I still like looking at them just the same! So I love how this turned out! I stamped all the images (from Unity Stamps, of course!) and then cut them out. Did some doodling and faux stitching and ran the middle frame through the Cuttlebug for some texture. Stuck it all down - and I love how easily it was all finished! I am afraid that I am absolutely in LOVE with this stamp!!! It is my first Itty Bitty from Unity Stamps, and has been sitting there for a little while just waiting to be used. This morning has been one of those days where it is gray and overcast, then the sun peaks out and everything is brilliantly sunny, then the sun goes behind a cloud again, comes back out, and does it all over again! I love the contrasts, and suddenly thought of this stamp, and was inspired to sit and work on it! I really love how it came out! Just stamped the image and sentiment (both from the same set! ), colored the image with my Prismacolor colored pencils, inked the edges of everything, added some ribbon and buttons with little floss bows - and that easily, it was all finished! Just wanted to share a quick fun card that I have been working on a little here and there over the last couple of days. 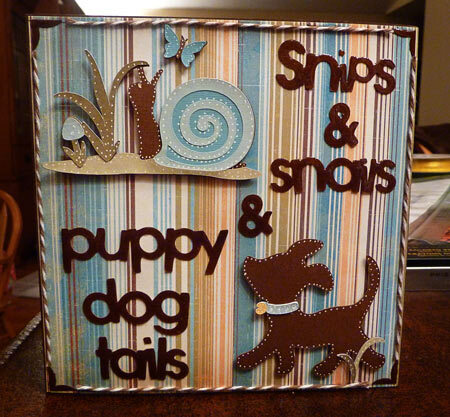 I discovered that my local Ross store has scrapbooking stuff - dangerous information! But I found this paper that was so yummy...and the price was great, so how could I resist? The card base is cut from Birthday Bash cartridge. It was actually intended for something else that didn't work out, but it was perfect for this! Did LOTS of stitching with my white gel pen as I went around it. The stamps are, of course, from Unity Stamps. Added some glitter with zip dry glue to one of the grab bag stamps (that I used yesterday in a different way), as well as a sentiment from a set I got on sale from them. Added some dew drops, a Prima flower with a button and some Baker's Twine for a bow. Just wanted to share a quick card that I made the other day. I'm so excited to have a friend here visiting for the next couple days from out of town - all the way from Kansas! So...don't know how much I will be getting done as far as crafting in the next couple of days...but I am so excited to spend time visiting with her! For this card, I used some of the stamps I got in the grab bag sale they had last week. Colored it a bit with my Prismacolor colored pencils, then used my Tim Holtz distress tool on the edges of all the paper with some ink to finish it off. The sentiment is from Unity Stamps January Kit of the month, and some of the grab bag stamps got stamped on the backgounds to make patterned paper. 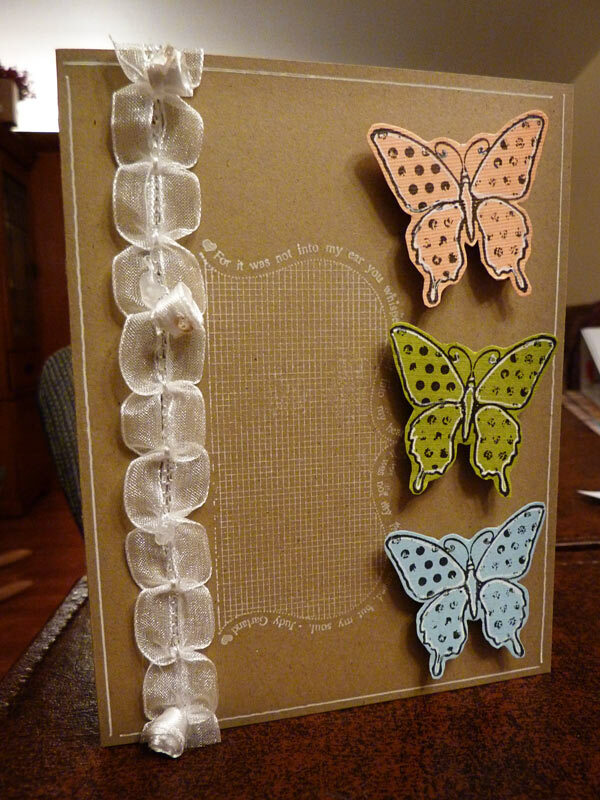 Added a bit of paper punched with my Martha Stewart border punch, and some Baker's Twine. Thanks for looking - and Happy Valentines Day! Yesterday was my niece's 2nd birthday, so I wanted to make a sweet girly card for her...I also wanted to use my newest cartridge, Nate's ABC's. So...I just picked a cut and used lots of pink! Distressed the edges of the background paper with my Tim Holtz distress tool - works so good, and is really inexpensive! I love it! Also inked the edges of all the cuts with brown ink. Added a sentiment from Pink by Design, and some faux stitching. Finished off with a little Baker's Twine bow at the top. Well, here is the final day of the week before Valentine's Day cards for my hubby. I know this doesn't look much like a Valentine card - but it is to let him know how much I love his drive to learn and grow! He is one of the smartest people I know, and I love that I can go to him if I have a question, and he will most likely know the answer. I can also send our daughters to ask their Daddy when they ask the weird and difficult questions that they seem so good at coming up with! He is in college right now, as well as working full time - and I appreciate how hard he is working to do well at that, as well as still being a husband and father. And I love best of all watching and listening to him read God's Word - and then continue on to live by it each and every day. So for this card, I used Nate's ABC's, and added a TON of inking, a sentiment from Pink by Design, and couple little heart stamps from my stash to add around the edges. Quick and simple!!! Anyway, I used Just Because cartridge for all the cuts, and added a Peachy Keen face to the ice cream. I was going to enter it in a challenge using Just Because, but realized after I finished that I had to have a stamped sentiment...and I used the computer to generate the sentiment, because I couldn't find what I wanted in my stamps! Oh well! Also added a little Baker's Twine in one of the new colors, some inking, and some faux stitching around the edges. Almost forgot - also used the Cuttlebug on the background. Ran it through upside down, but kind of like how it is "de-bossed" instead of embossed. Thanks again for looking! 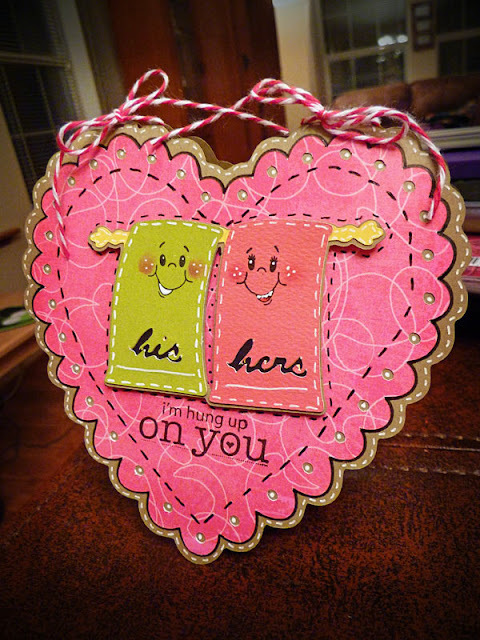 Well, another day, and another card to let my hubby know he is loved and appreciated. This is my card for day 3 of the week leading up to Valentines Day. This card kind of has a story behind it. I totally LOVE trees...and everywhere we go I am always noticing the trees along the way. I know...kind of weird! Anyway, this card is to thank him for his adventuresome spirit, and his love of the open road - we both LOVE taking road trips. These trips have taken us to the Redwoods in California, the Sugar Maples in Quebec, Canada, to the few (but really cool) trees in Oklahoma and Kansas, and hiking and camping under all the trees in our lovely area in the Northwest. 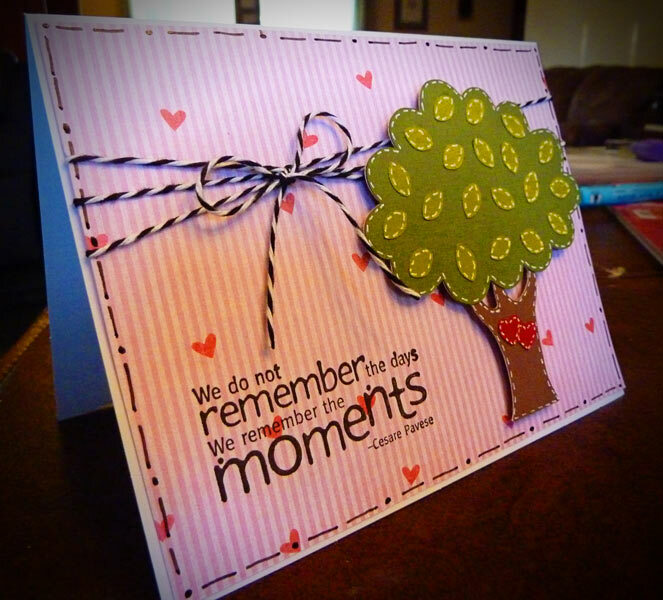 I love how we have carved many of the memories of our life in this way. Anyway, used the tree from Sweethearts, sentiment from Unity Stamps, Baker's Twine, some doodling - and lots of faux stitching. 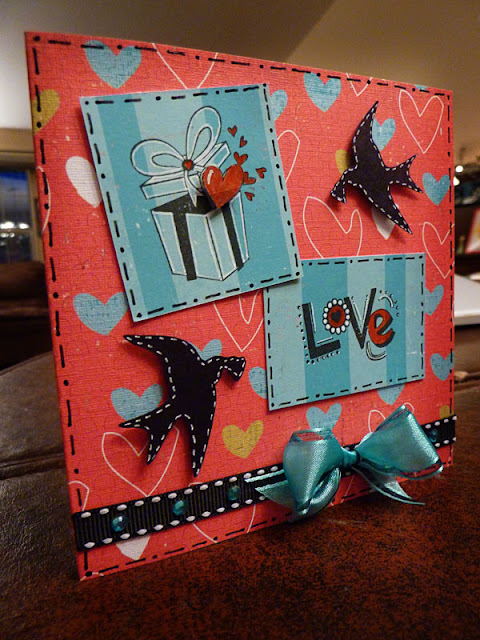 I am entering this in the Wacky Wednesday Challenge over at More Than Favors to make a Valentine's Card. Thanks for looking - hope you are having a great day!!! This is day two of the cards I decided to make for this week leading up to Valentine's to thank my husband for all the things I love and appreciate about him! This one is to thank him for the fact that I feel like we are always a team - standing under the same umbrella no matter what storm we face. 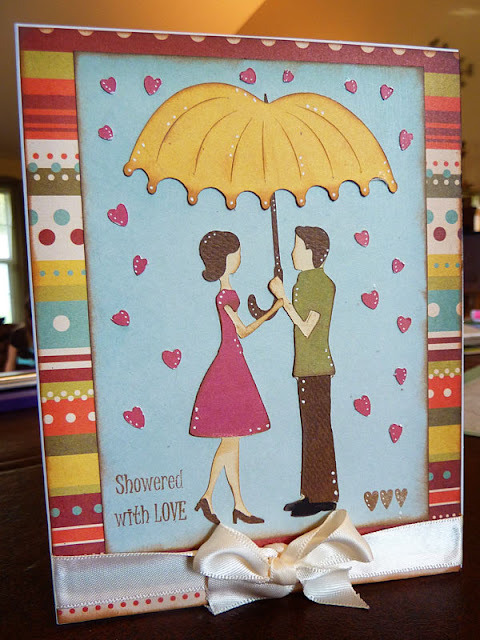 It makes me feel "showered with love"! He found the first one in his lunch yesterday and called to tell me he loved it - but I don't think he has any idea that I might be putting another one in today! For this card, all the cuts came from the Sweethearts cartridge - and I cut some extra hearts out to make it a real "shower" of hearts! 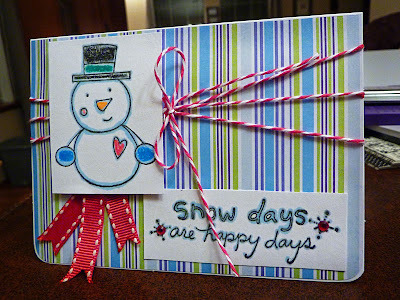 Lots of ink and doodles with my white gel pen, finished off with a simple bow and a sentiment from Pink by Design. Had a set of Unity Stamps that I hadn't tried yet, and a challenge that I wanted to complete over at More Than Favors Wacky Wednesday's, so I squeezed in a few moments to sit down and play and make this. 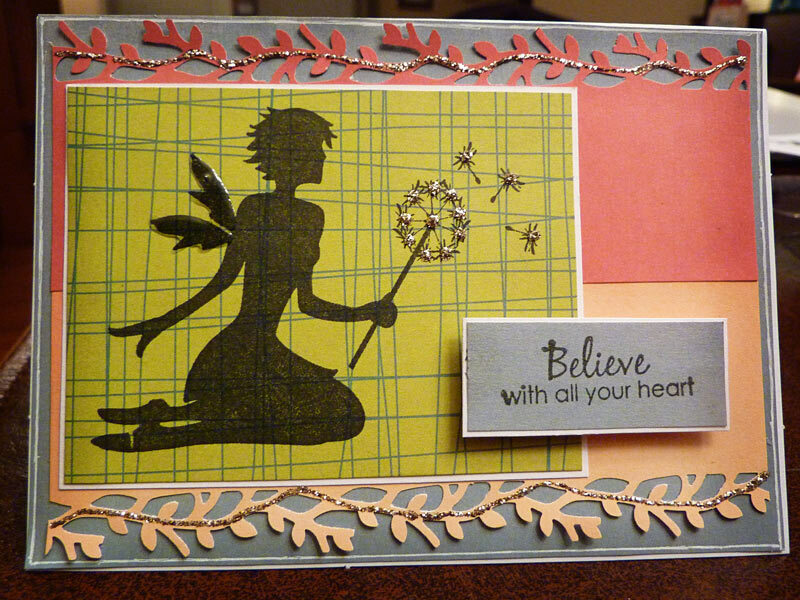 All stamped images are from the same set, the August 2010 Kit of the Month. 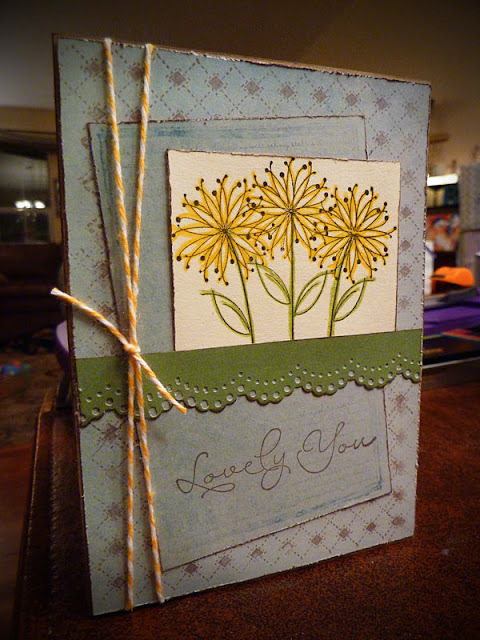 I stamped them, trimmed them to size, and then distressed the edges with a pair of scissors. Never tried that before, so I think that is a technique I will have to perfect a little! Added some Baker's Twine and a little extra inking around the edges, as well as a few stick on pearls. 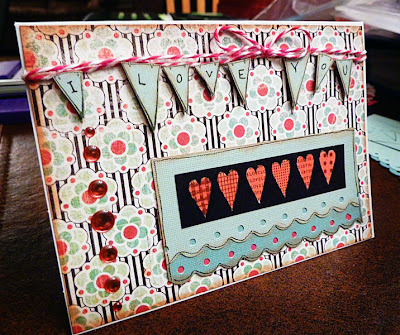 WINNER from the Sweetheart Blog Hop! Congrats!!! 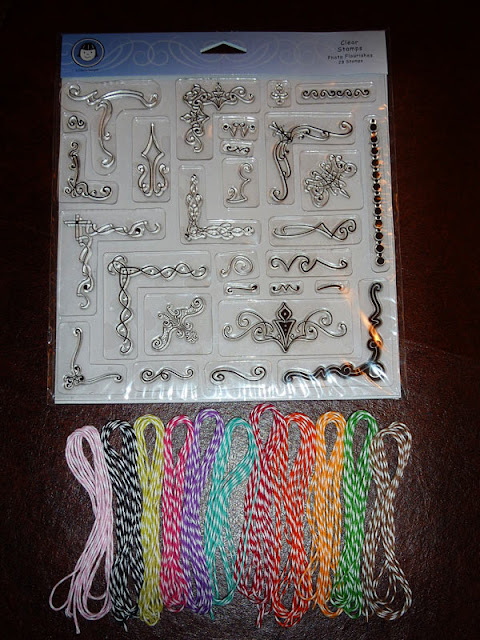 I will send you an email right away and get your prize off to you as soon as I hear back with your address! Thanks to everyone who hopped along, to the ladies who invited me to join them, and to everyone for their kind comments! This is a pretty simple card that I actually made several weeks ago, and just didn't share yet, on the off chance my husband happened to get on here and see it. But it is safely tucked into his lunchbox to surprise him at work today, so I decided it was safe to share! Our wedding (almost 11 years ago!) was kind of centered around Precious Moments (our invitations, cake topper, programs, etc...) because the first gift he ever got for me was a Precious Moments figurine. This stamp is actually the one I used to make our thank you cards for wedding gifts! I just happened to come across it when I was cleaning a while back, and had to sit down and make a card for my husband with it! 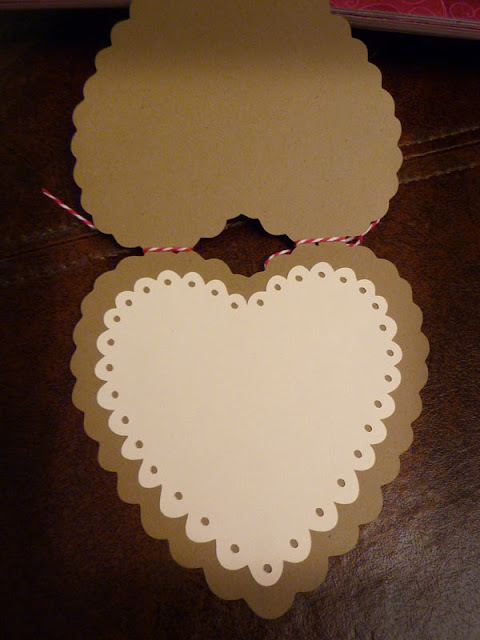 My plan this week is to try to make a card everyday for my husband, leading up to Valentines Day, to let him know all the different things I love and appreciate about him. This first one is letting him know how much I appreciate how often I am cold and he snuggles me to warm me up. Seriously, I think I have the coldest toes on the planet, and he puts up with those things poking at him for warmth ever single night! 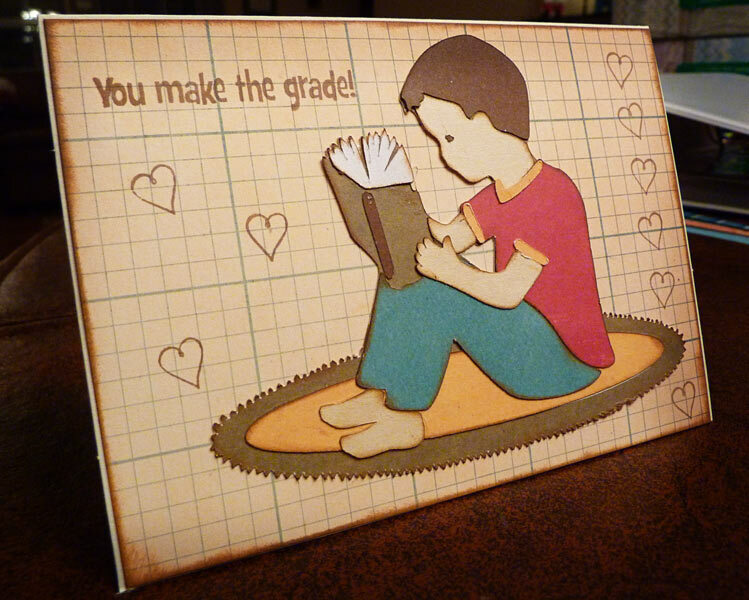 The card is pretty self explanatory - stamped and colored with colored pencils, wish I could remember where I got the sentiment from! Added some ribbon with a bow and a little bit of inking. I'll be back a little later this morning to post the winner for the Sweetheart Blog Hop! Lots of Unity Stamp goodness! 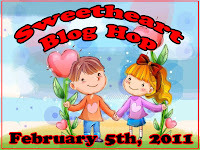 If you are looking for the Sweethearts Blog Hop either scroll down or click HERE. 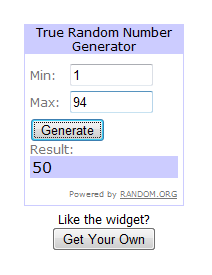 I will be drawing a winner for my little giveaway on Monday morning! Sigh...I just love my Unity stamps! Here are just a couple of cards that I have made in the last day or two with some of them. The last two cards (I couldn't pick one!) are for the All Things Unity Challenge . They actually all would qualify, since I only used Unity Stamps on all of these, but I used the first one for something else, so I just counted the last 2! 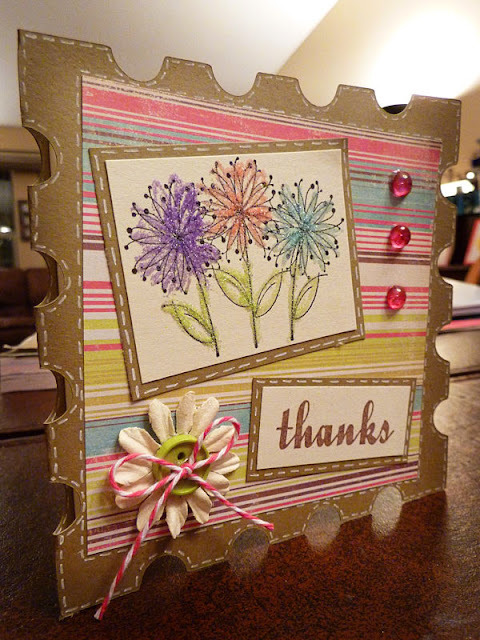 The first one I posted on Splitcoast Stampers for the Unity Stamp Co. Friends with Flair Friday. Stamped the same image over and over in alternating colors, stamped and matted a sentiment, and added some Bakers Twine and faux stitching. The next one I tried out the one Prismacolor marker that I have for the blue edging, and colored the rest in with my Prismacolor pencils. Added some Bakers Twine and ribbon from my stash. On the last one, I stamped the butterfly 3 times on different colored cardstock, cut them out, added a little highlighting with my white gel pen, and pop-dotted them from the card. 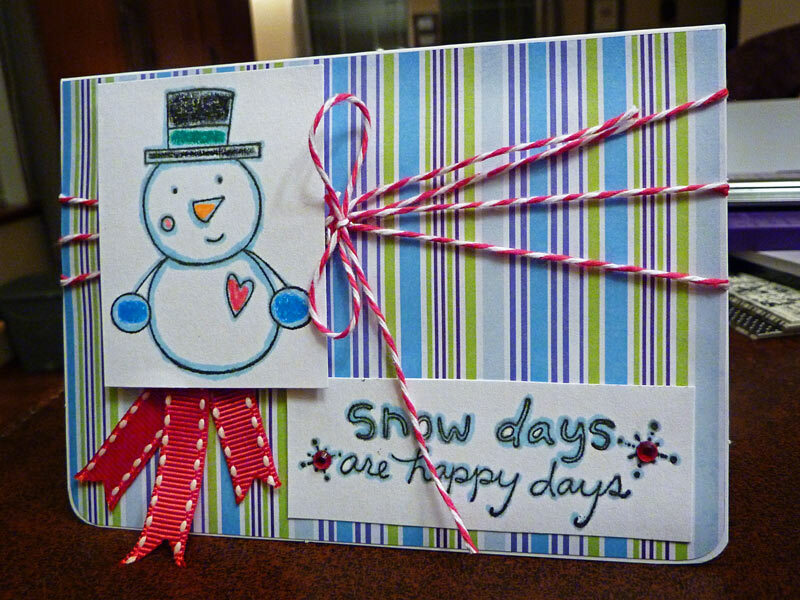 Added another stamp in the background, some ribbon, and a bit of doodling around the edges. Sweetheart Blog Hop is Here!!! 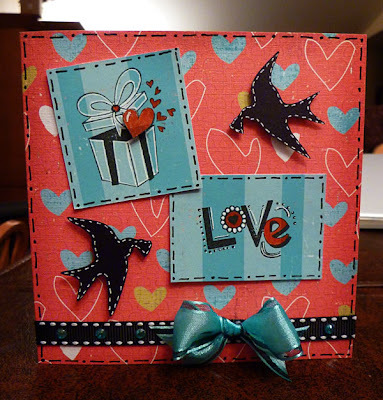 Welcome to my stop along the Sweetheart Blog Hop! If you got here from Libby, then you are in the right spot. Here is the lineup, in case you get lost along the way. If you happened across in the middle, please head back to the beginning - so you don' t miss anything! So I have 3 different Valentine cards for you today. 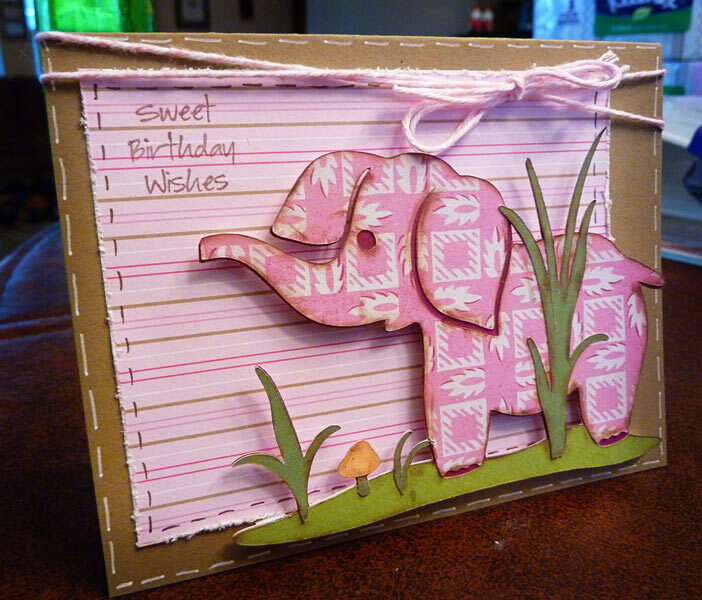 I was going to try to make something a little different than a card, but I guess I just love making cards too much! Anyway, here they are along with all their details. I also have a little something I am giving away - so make sure and read to the end of this post! I LOVE how this first card came out! It uses several of my favorite things! 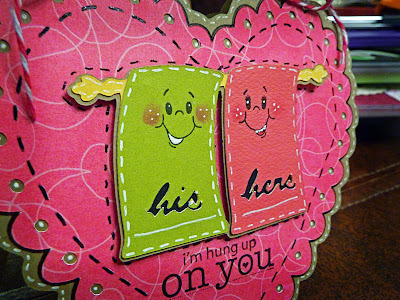 My Cricut Expression (Sweethearts cartridge for the shaped card welded together on my Gypsy, as well as the cute little his and hers towels), Peachy Keen Stamps (The cute little faces! ), Unity Stamps (the sentiment! ), Baker's Twine from The Twinery (the bows on the top), and my white gel pen and Sakura Glaze black pen for all the doodling. Here is a close up of the towels - they are pop-dotted from the background for a bit of dimension. And here is the inside all prepared for writing a sweet note in! 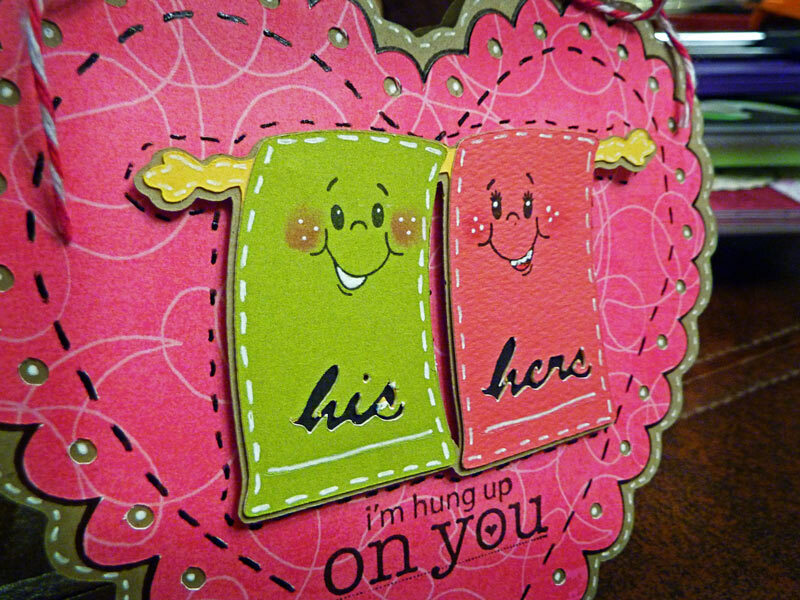 This second card I think I just love because of the colors! Pretty much all using some more of my Unity Stamps. 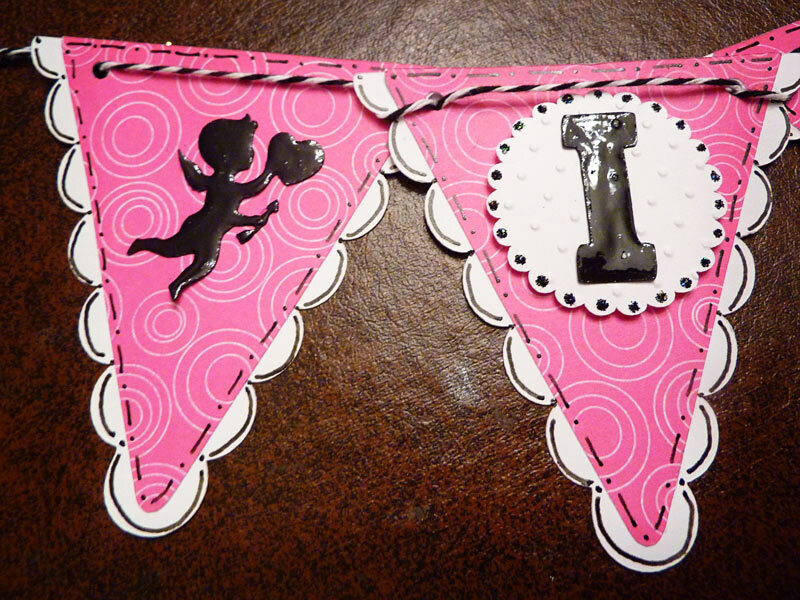 Stamped the banner twice, cut them both out, then stacked them with pop dots to give some dimension. Added twine to "hang" the banner on, and wrote "I LOVE YOU" on my hand. (That was a brave moment - I usually don't like my handwriting!) 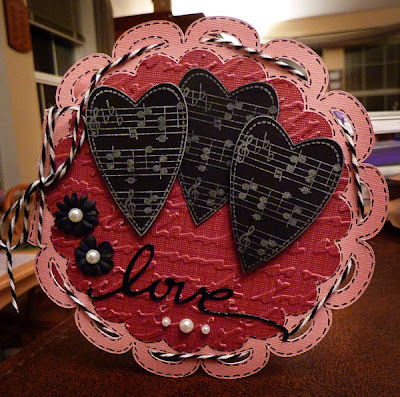 Also stamped the hearts and cut them out, then glued them on black paper, and added a couple layers of coordinating cardstock punched with a Fiskar's edge punch. Finished off with LOTS of inking, and a little self stick bling. This one was totally inspired by the paper. I was flipping through my stash looking for the perfect paper for some pics I was scrapbooking, and happened upon this. Didn't even remember that I had it!!! Totally had to make something with it! So I pulled out my Unity stamps, stamped them and added some coloring with my Prismacolor pencils and my white gel pen, pop-dotted the biggest heart coming out of the box, and added some doodling with my black Sakura glaze pen. Then I had these little birds with hearts in their beak that I had cut for another project from A Child's Year cartridge (the icon feature) and never used. So I added some stitching on them and pop-dotted them onto the card. Finished with some ribbon, a bow, and a bit of bling stuck on with my Jolee's heat set tool (another favorite tool! ), even though the picture doesn't show it very well. This picture shows the pop dotting a little better. So...leave me a comment and a way to contact you, and I will pick a random winner on Monday morning. Your next stop is Lisa, over at http://ljsscrapshack.blogspot.com/ - have fun the rest of the way! 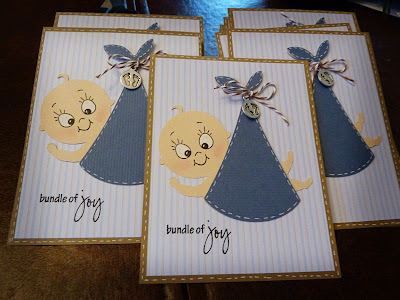 A friend and I got together day before yesterday to make 30 baby shower invitations. After my last experience, and trying to keep things simple, I am SOOO happy with how these came out!!! I think they look super cute, and it only took us about 3 1/2 hours together to make all 30 of them! And part of that time was spent chasing all four of our kids around when they needed it! So they were pretty quick and easy, and yet I still think they are perfect! The baby his blankie were cut from New Arrival, and we added a cute Peachy keen face. Did some stitching around the edge of the card and the blanket, and used some Baker's Twine to tie on a cute little footprint charm that I happened to have in my stash. Finished off with a sentiment from Pink by Design, and then printed off our info for the baby shower, and attached it to the back of the cards (they were postcard style). Thanks for looking, and don't forget to come back tomorrow for the Sweetheart Blog Hop!!! There were a few different challenges I wanted to enter all at once, so last night I made this cute little banner to surprise my daughters with when they wake up this morning. I'm going to let them hang it up in their room. I'm sure they will be SOO excited, and I can't wait to see their faces! The first challenge was over at Made by Momo, and it was to use the colors hot pink, black, and white and use at least 1 heart. If that wasn't obvious already! The second challenge was at Crafting with Cristina, and it was to make a Valentines themed project - but NOT a card! 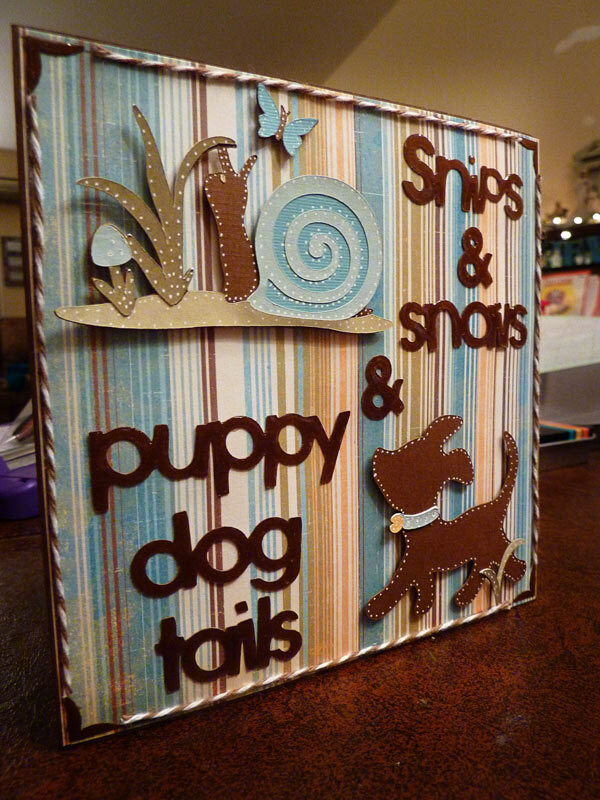 That made it a little tougher for me, since cards are definately my favorite thing to make! The last challenge was over on the Cricut Circle blog, and it was to make a banner, with at least 3 Cricut cuts. So I cut the banner from Birthday Bash, as well as the scalloped circles and the letters. The heart came from Simply Charmed, just without the face showing, and I cut the top white layer by welding together two different size hearts. The little cupids are from the Sweethearts cartridge. I added Glossy Accents to all the black parts of the cuts, icicle Stickles to the center of the heart, and black Stickle dots to the edges of the white scallops and the white part of the heart. Did some doodling, and then strung it together with Baker's Twine. 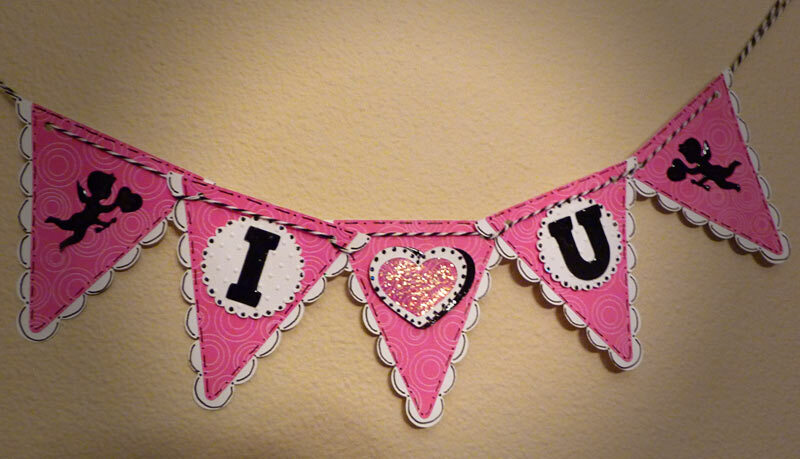 Oh yeah...almost forgot...also pop dotted the I (heart) U part as well! So...Mom and Dad - if you happen to be looking at this - don't scroll down until I hopefully see you later today and am able to give it to you (a day late!). On Monday evening, as I decided to turn the calendar over to February, I all of a sudden remembered that my Mom and Dad's anniversary was on the 1st!!! It was too late to make it that night, but as I went to bed, this idea popped into my head...so it came together pretty quickly in the morning! 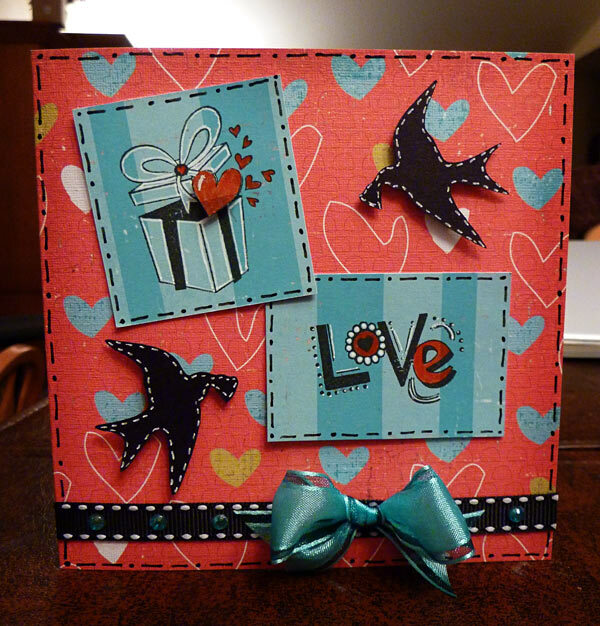 I am also entering it in the Valentines project challenge over at 40:31 Creations, since it is definately perfect for a Valentines card, even though I am using it as an anniversary card. 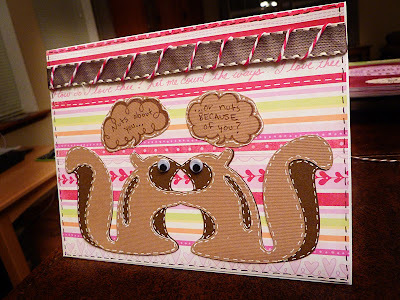 The cute squirrels came from Give a Hoot cartridge, and I added some stitching and wiggly eyes to them. The little thought bubbles are from a Unity Stamp set, and I just hand wrote in the sentiment. I couldnt' quite find the right ribbon that I wanted for the top, so I just took one I liked, and wrapped it with Baker's Twine to make it match like I wanted. Added some faux stitching around the outside. Happy Anniversary Mom and Dad - I think 42 years this year if I counted right!!! Love you! Bet the title REALLY made you want to look, huh? 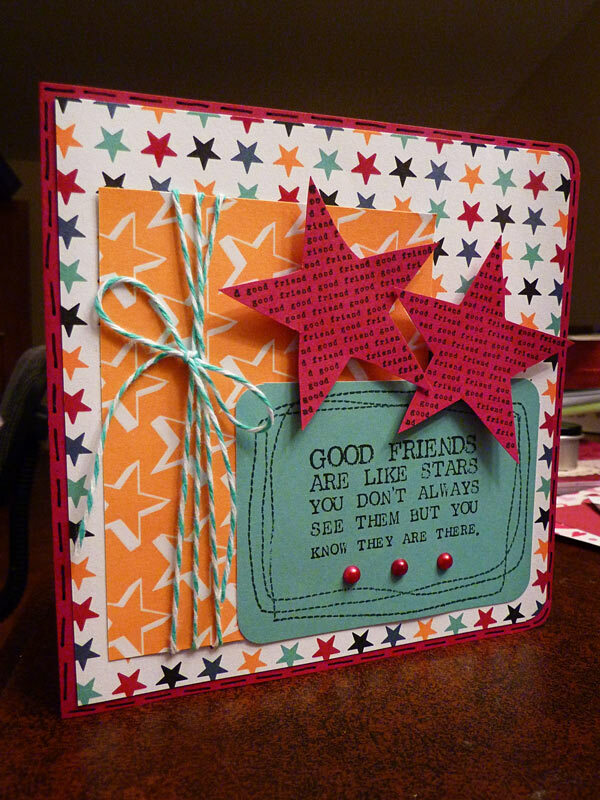 My brother-in-law's 18th birthday party was tonight, and since I needed to make a card for that, I also decided to put it in the challenge over at Scrapbookaholic By Abby - anything goes, but use a stamp somewhere on the project! I thought of the card because the birthday guy had shown us some Youtube videos a while ago of these little marshmallows with faces, screaming as they found out they were going to be roasted over a campfire. He also loves coffee, tea, cocoa, and anything like that - so I decided to kind of combine the two ideas!!! I LOVE how it came out! So much fun! Anyway, used Unity Stamps for the sentiment on the mug, and the corners, and a Pink by Design sentiment in the left hand corner. The mug is cut from Gypsy Wanderings, by hiding the extra contours on it, and the steam is cut from Joys of the Season and covered with Glossy Accents. The marshmallows are just rounded off rectangles that I got off of the Preserves cartridge, but I know you can find that on several different cartridges as well. Added some cute Peachy Keen faces, by mixing together the eyes from a couple different sets, and the mouths from a face part set that I had. Inked the edges of the marshmallows, and drew the little half circle to make them actually look like marshmallows! Pop dotted everything, and finished off with a little faux stitching! SOOOO much fun! I am so happy with how this card came out! It was really simple, and just used my Unity Stamps from the January Kit of the Month. Only added some baker's twine for the bow, some stick on pearls, a little faux stitching, and pop-dotted the stars after stamping them and cutting them out. I think what I love the best is how the colors mesh together so perfect! Anyway, thanks for looking!